Jack Dunn Is Peeved By Report Of The Kid's Sale. "Tabasco One" Wires Willingness To Talk Business Wicks Will Visit Him. The latest Information from New York, where baseball players are being traded and sold almost every hour, is to the effect that Norman Elberfeld, the "tabasco kid," has been sold to the Chattanooga club and is to be captain of the team. That news hit Jack Dunn pretty hard, for Jack felt that be had everything fixed except the name of Elberfeld upon an Oriole contract. "If the information is absolutely correct," said Dunn, "it is a bad piece of business. I was given the authority by Clark Griffith, manager of the Washington team, to talk business with Elberfeld. Billy Wicks has purchased his ticket for Albion View, Tenn., where Elberfeld lives, and was to have started on his journey in the morning." Dunn waxed warm while discussing the report that the deal for Elberfeld had been closed. He said he could not believe that Griffith had sold the kid after telling him to talk business with Elberfeld. Jack sat right down and wired Elberfeld that he would pay him a certain sum of money to play here next season. He reasoned that if the deal has not been absolutely closed that he still has the authority to make Elberfeld the offer, and as Griffith has not notified him that Elberfeld has been disposed of, Dunn thought telegrams would end the matter even quicker than a visit to Albion View. 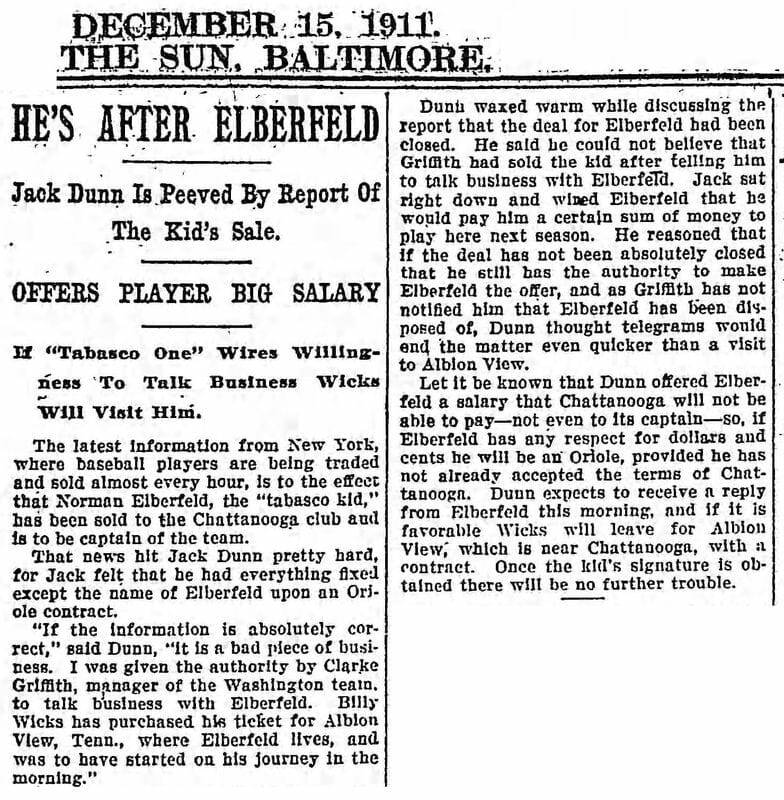 Let it be known that Dunn offered Elberfeld a salary that Chattanooga will not be able to pay—not even to its captain—so, if Elberfeld has any respect for dollars and cents be will be an Oriole, provided he has not already accepted the terms of Chattanooga. Dunn expects to receive a reply from Elberfeld this morning, and if it is favorable Wicks will leave for Albion View, which is near Chattanooga, with a contract. Once the Kid's signature is obtained there will be no further trouble.